Venus Williams was acting lawfully when she drove into an intersection before a fatal crash, police have said. The tennis star's SUV had collided with a sedan on 9 June and the sedan's passenger Jerome Barson, 78, was injured. He died as a result of those injuries on 22 June. Police said new footage had emerged taken from the entrance to the gated community where Williams lives. 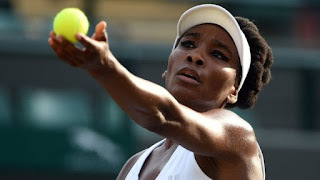 The statement said: "Based on the evidence obtained in the ongoing investigation, it has been determined the vehicle driven by Venus Williams lawfully entered the intersection on a circular green traffic signal." It had been thought that Williams, 37, had run a red light, failing to give way to the Barsons. The footage from Palm Beach Gardens Police Department shows Williams headed north and, as the light went green, she went forward but had to stop as a car turned left in front of her. She then moved forward again before being struck by the car driven by Mrs Barson who, by then, had the green light. Major Paul Rogers of the Palm Beach Gardens Police Department said police have not made a final determination of fault in the investigation. Williams has not been cited or charged but the Barson family filed a wrongful death suit against her last week. Mr Barson's family attorney, Michael Steinger, said in a statement that the video "continues to support the fact that Ms Williams remained in the intersection at a red light, violating the Barsons' right of way." Williams' lawyer, Malcolm Cunningham, said it was Mrs Barson's obligation to make sure no cars remained in the intersection before she entered.